Drone startups have been attracting a lot of investment in the last couple of years and here at Balderton we thought it would be good to discuss some of the key trends. There’s so much going on, in so many different parts of the drone ecosystem, it can be hard for a newcomer to know where to begin (I know it was for me). I hope this guide proves a useful introduction. In Part 2 I’ll dive into investment trends, discuss the various market segments in more detail and tell you where I think the investment opportunities lie. So what actually is a drone? A drone, also known as an Unmanned Aerial Vehicle (UAV), is an aircraft with no pilot on board. There are two key types of UAV: fixed-wing and rotary-wing. You’ve probably seen pictures of military drones: those are usually fixed wing drones. Meanwhile, 90% of consumer drones out there are rotary-wing drones. How do you segment the market? The biggest source of confusion for any newcomer to the drone industry is the sheer breadth and variety of companies in the market. 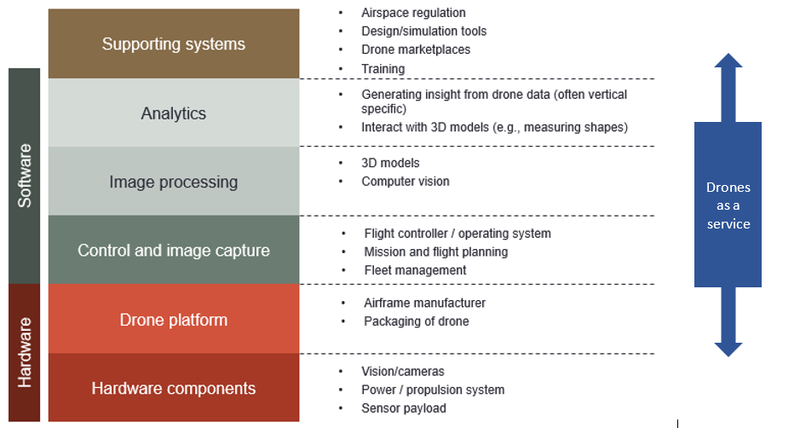 There are companies doing everything from making multispectral sensors for drones, to offering drone training for pilots, to building software for drone design simulations — not to mention companies that make the drones themselves! Unfortunately, these tend to conflate customer type (e.g., consumer / commercial / military), product type (e.g., drone services / drone components) and application sector (e.g., insurance / oil & gas). Somehow, there are simultaneously too many segments and too few — some of these segments are unnecessary and others are just way too broad. Spanning across almost all of this is a fourth category of “Drones as a service”. A typical way in which this might work is: a drone is booked through the service provider, which then flies a drone on behalf of a client, then collects data and feeds back the results of the analysis (if any) to the client. We’ll come back to this model later in Part 2. For an investor like Balderton, the most interesting customers are those in the Consumer and Commercial sectors — and this post will really be focused on those two areas. How big is the drone market? One of the problems with most market sizings is that they only look at the hardware side of the drone ecosystem. The typical methodology is to forecast the number of units that will be sold and multiply this by the average unit cost. More sophisticated methodologies account for variation in customer type and end use (e.g., a drone used for O&G inspection will probably be more expensive than one for real estate photography, but this will be offset to an extent by volume). Anecdotally though, people believe that the software market will eventually be at least as large as the hardware market and is probably currently around half the size. As you can see, we’re looking at a market of nearly $13bn p.a. by 2020. It’s important to note that this is an estimate based on platform sales alone. 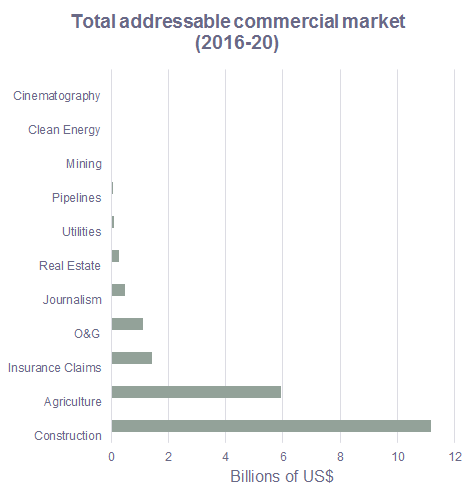 You could conceivably double that 2020 figure for an overall drone ecosystem market size. It’s also interesting to see that most of the growth is expected to come from commercial drones — even though there is ample room for growth on the consumer front. In terms of both volume and sales, the consumer drones space today is still at a nascent stage of development. Relative to other discretionary consumer electronics in a similar price range, drones have only a tiny share of wallet. The action camera market (dominated by GoPro) is 5 times bigger than the retail drone market, and consumer drone market is only 6% the size of the video games console market. The growth is really driven by construction and agriculture. In construction, drones are expected to be used to survey land for building sites, measure building progress, facilitate comparison with plans, produce 3D renderings of sites etc. In agriculture, the name of the game is “precision agriculture” — helping farmers optimise their processes. For example, drones can be used to count crops or measure crop densities so farmers know exactly when and where to apply fertilizer, or when to move their cattle to new pastures. 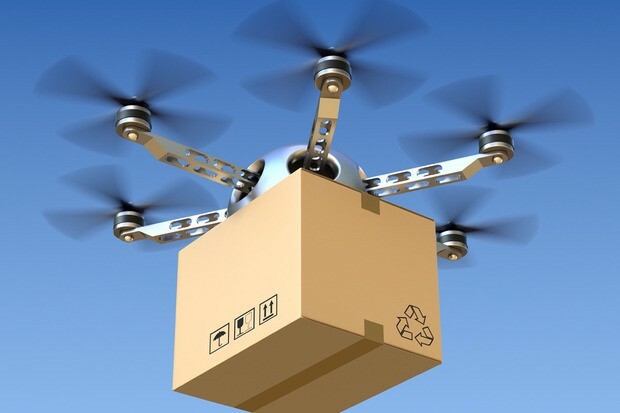 The natural question at this point is: what about is drone delivery? Isn’t that meant to be one of the biggest uses of drones? Well, yes and no. Yes — I do believe in the long term there’s a lot of potential here. But I think we’re still several years away from it becoming a viable possibility, which is why I’m not including it in any market sizing. • Technology — There are still a bunch of tech improvements that are needed, and extending battery life beyond the typical 10–15 minutes is chief among them. Also paramount is safety: if the drone fails while flying over a heavily populated area, how can you ensure it doesn’t hurt anyone? We then need improvements in autonomous flight to ensure the drone doesn’t fly into anyone or anything and can accurately reach its destination. • Infrastructure — The drone needs to be trackable by air traffic control, and there needs to be variously legal and insurance changes to allow unmanned drones in civilian airspace. But beyond that, we need the infrastructure to actually enable unmanned delivery — i.e., what happens when the drone reaches its destination? Where and how does it drop off the package? Who is responsible for collecting it? • Regulation — This is probably the biggest issue in the near term. For drone delivery to really work, governments need to allow the operation of drones beyond “visual line of sight” (BVLOS). In the US and most of Europe it’s not clear when this will be allowed. Additionally, drones are still not usually allowed anywhere near people. Both of these are serious impediments to drone delivery taking off (sorry for the terrible pun). On that note, let’s talk a little more about regulation. Regulation, as you might suspect, is extremely relevant when talking about drones. It’s also worth noting that I’ve mainly been looking at this from a European / US perspective, as is aligned with Balderton’s investment interests. So far, regulation has been more favourable in UK/Europe compared to US, although things have been changing there. Let’s use the UK as a benchmark and see how some the regulation of some other countries stacks up. People are hoping the UK regulation opens up a bit with the Modern Transport Bill. For one, there is no prospect of BVLOS flight in the UK right now and people are hoping this will change. France and Germany have pretty similar rules to the UK, with some differences. For example, in France a VLOS autopilot is allowed under certain conditions. Meanwhile Germany has some of the most progressive drone rules in Europe — state authorities can permit BVLOS flights when the operator is able to verify a safe flight record. Notably, DHL have been granted exemptions to test BVLOS drones in Germany. Things are not too different in the US either although consumers have to register their drone with the FAA, and there’s a 25kg limit. Commercial users used to have a harder time but on June 21st this changed with the Part 107 legislation. Getting a commercial drone licence is now a straightforward process with restrictions similar to the UK. The FAA is also working with PrecisionHawk and BNSF Railway (owned by Berkshire Hathaway) to test commercial BVLOS drones — but under very controlled conditions far away from other people. In any case, these examples raise hope that widespread BVLOS technology will ultimately be accepted by the FAA. That’s it for now! In my next installment I’ll talk about the different market segmentations in a bit more detail and where I think the investment opportunities lie. Thanks to the whole team at Balderton and specifically James Wise and Sam Myers for their advice through this. Stay tuned!